Principles and practices of visualization have always been valuable tools in all fields of research. The formation of representations plays a key role in all aspect of science. Prior research in the area of visualization demonstrates that representation of data hold great potential for enhancing comprehension of abstract concepts and greatly benefit collaborative decision-making and project performance. The purpose of this study is to examine the effectiveness of integrating various methodologies in the production of a visually coherent proposition. 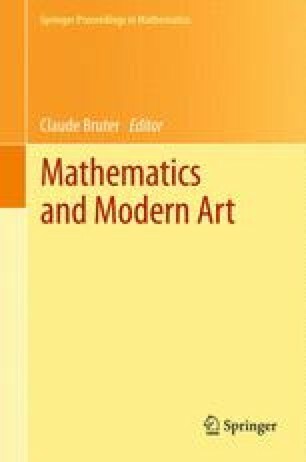 The author explores the dynamic of visualization in the digital environment and brings together elements of fractal topology, optical distortions and color theory components in an esthetic statement. The background and information selected for this purpose is based on specific cognitive processes, neurological and topological researches developed at the turn of the twentieth century by various experts in the field of investigative science: mathematicians Cantor and Sierpinski, neuroscientists Hermann, Hering, Wundt and other analytical minds such as Itten and Kandinsky that, at a particular time in history, demonstrated the similarities and overall cohesion of an intellectual and scientific discourse that helped articulate the technological and esthetic world we know today. I would like to express my deep and sincere gratitude to the following: Dr. Anders Pelander, Dr. Ruby Lathon, C.P. Bruter, Ulrich Niemeyer, Roland Piquepaille, Lokesh Dhakar, Alessandro Fulciniti, Brigitte Furst, Steve Wold and the many other who provided me with inspiration, advice and technical guidance.